K 55 12585230 https://www.kaercher.com/ae/home-garden/cordless-electric-brooms/k-55-12585230.html The Kärcher K 55 cordless electric broom is ideal for intermediate cleaning and is suitable for all floor coverings. With detachable roller brush, telescopic handle and removable battery. The Kärcher K 55 cordless electric broom is ideal for intermediate cleaning and is suitable for all floor coverings. With detachable roller brush, telescopic handle and removable battery. The Kärcher K 55 cordless electric broom is ideal for quick intermediate cleaning and meets the highest standards of quality, ergonomics and user-friendliness. Whether for flour, crumbs, crisps or leaves from house plants, the practical cordless electric broom is ready to use in no time and enables quick, convenient cleaning. The brush removal technology ensures easy, quick and hygienic brush removal at the push of a button. This means that the brush can be cleaned or replaced effortlessly at any time. The waste container can be emptied quickly and hygienically without the operator coming into contact with the dirt. 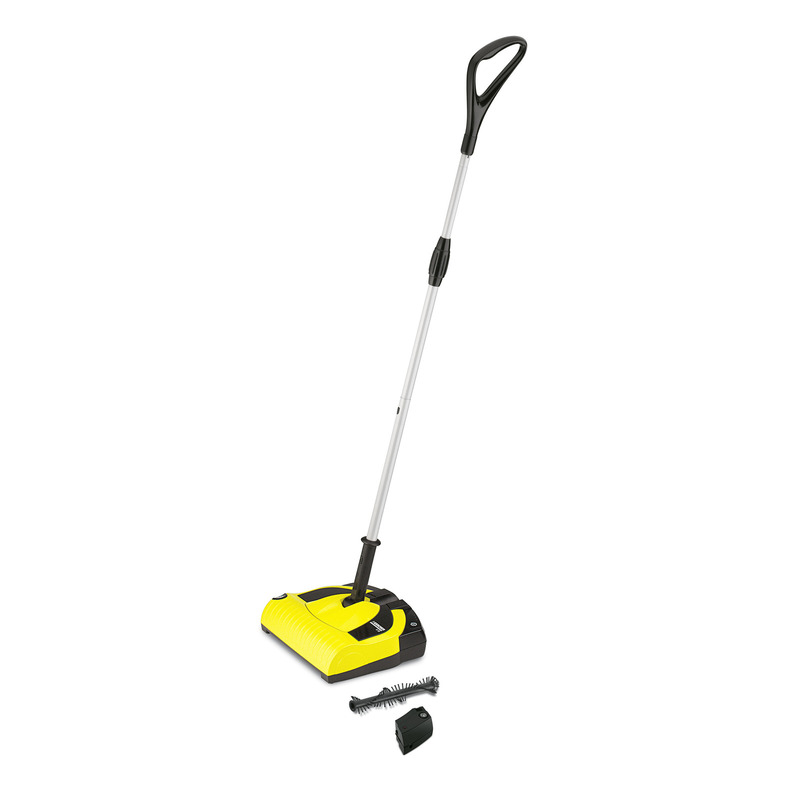 Thanks to the wall bracket and battery charger, the cordless electric broom is always ready to use. The removable battery can be charged both inside and outside the device. The device can be conveniently switched on and off using the foot switch. The individually adjustable telescoping handle ensures a comfortable posture. At around 2 kg, the device is easy to transport and manoeuvre. The device's low height means that it can also be used under furniture. The standard brush allows sweeping very close to edges, up to a distance of 1 mm. K 55 and charger are stored away but still within easy reach.